While Fortnite has continued to grow in popularity, when Epic Games announced that it would be bringing the game to mobile platforms earlier this month, there was plenty of curiosity as to how well the title would translate to handheld devices. Part of that curiosity related to graphics – just how well would smartphones and tablets be able to recreate the look of a game designed for machines with supposedly better graphics capabilities? Now that plenty of people are playing the game on iOS devices via the closed, invitation-only beta program, we’re starting to get a feel for how iPhones in particular are handling the title. As it turns out, pretty well indeed, if you have an iPhone X at least. 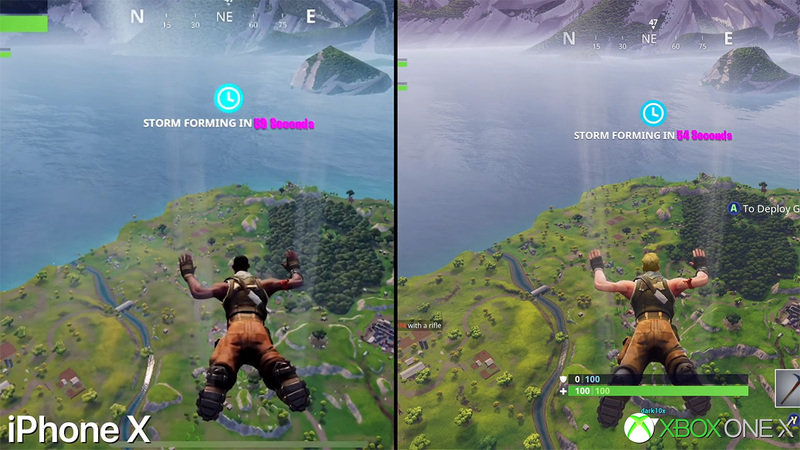 The folks over at DigitalFoundry took the chance to pit an iPhone X and an Xbox One X against each other, with Fortnite running on what is the most powerful game console ever released. With that in mind, you would be forgiven for expecting this to be a one sided battle, but with the iPhone X being a powerhouse of its own, that’s not entirely what happened. Epic Games may have pushed updates out for the arrival of the Xbox One X, and the PS4 Pro, for that matter, but it’s quite amazing how closely the iPhone X is able to keep up with the images created by Microsoft’s console. The differences are, of course, there, especially when both devices’ outputs are viewed side-by-side, but you have to marvel at what that iPhone is capable of. Check the DigitalFoundry video out for yourself and see what you think. There is, of course, one downside to the iPhone X that the Xbox One X doesn’t have to contend with – there aren’t many 4K TVs being sold today with big notches missing out of the top of them. A cheap shot, I know. Fortnite Mobile APK For Android Update: What’s The Latest On The Release?